GUARANTEED UNBREAKABLE. Solid state fluoropolymer body makes micro redox electrode virtually unbreakable. EXTREMELY SMALL SENSOR SIZE. Tip diameter of the ArrowDOXTM electrode is only 1mm. LOW IMMERSION DEPTH. Immersion depth for the ArrowDOXTM micro combination redox electrode is 0.5 mm. GUARANTEED UNBREAKABLE. Electrode features solid state sensor and fluoropolymer capillary tube making it virtually unbreakable. Electrode is guaranteed against breakage for the life of the probe. Why settle for glass? MORE STABLE THAN GLASS ELECTRODES. The solid state design of the probe offers a much lower output resistance than glass probes of the same size giving a much more stable redox reading. 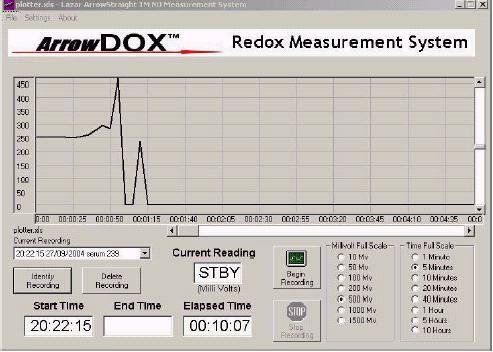 PLOT REDOX POTENTIAL CONTINUOUSLY ON YOUR PC. Monitor the change in oxidation-reduction potential with time directly on your PC and see a real time curve as the potential changes. Ideal for measuring the midpoint potential of cytochromes. TABULATE OXIDATION-REDUCTION POTENTIAL VALUES ON YOUR PC. Dip the micro redox electrode into a 96 well plate and record oxidation-reduction potential value on your PC while at the same time keying in the sample ID. Go to next well and repeat procedure. 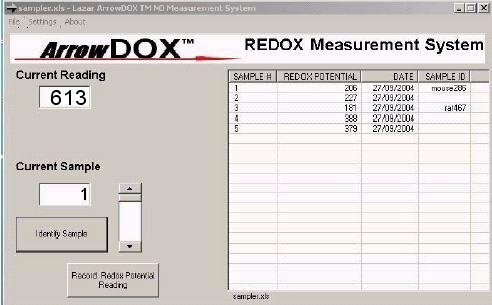 Get complete redox potential record of as many as thousands of individual samples. Special version of ArrowDox(TM) is also available with an extra long stem especially for measuring and plotting redox in NMR tubes. Enjoy the same accuracy and features as our regular ArrowDox(TM) System especially designed for NMR tubes. ArrowDoxTM Micro oxidation-reduction Measurement System including Model ORP-146S micro combination redox electrode with built in reference, Model 6230 pH/millivolt electrometer with RS-232 port to PC or laptop, PC cable, complete WindowsTM compatible software program for recording, tabulating, and graphing redox potentials on your PC or laptop. 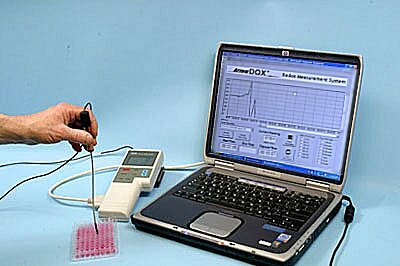 ORP-146CXS - ArrowDoxTM Measurement System. ORP-146CXSNMR - ArrowDoxTM Measurement System for NMR tubes.